Well, It's been quite the week in our lives. We headed cross-country; Final destination: Georgia! I have so many funny stories as most road trips do, but I think my favorite part was just seeing the 7 states we drove through. When you travel it always feels like your world stops, but everything else continues to move forward....almost without you. Nashville Flooded, Time Square had a bomb scare and a massive Oil Spill is causing major havoc. So much for a week on the road. Arizona - been there many times before. It was the same as it ever was. New Mexico - snowed pretty good here. It rained and was very mountainous. This was our first nights stay and surprisingly a good room for $54 bucks. Sam and Daisy refused to go to potty at all this day! Texas - I drove through some of Texas and napped the other half until we crossed over to OK. Driving down the freeway we saw two cop cars on the side of the road, both men with big cowboy hats shootin' the breeze. As we passed slowly, they tipped their hats to us. While it was funny, all I could think of was only in Texas! Oklahoma - At a rest stop some guy asked me "Are them english?" as he pointed to our dogs. I told him no, they were Boxers and then one of them barked at the guy....they've been liking to do this lately. The guy turned to his friend and said, "Them dogs ell' box ya!" Overall, this was a boring drive and we stopped at a gas station in Chekotah, OK (Carrie Underwood's) home town. Poor girl needed to get outta town to survive! Can we say ghetto! Tennessee - We have so many friends here and each one was struggling with the floods. We were thankful that we had been 1 day slower in our drive due to the flooding, but sad for everyone that had lost their homes. People were literally lining the sides of highways and outside their cars staring at what once was their neighborhood, now a lake. It was amazing and heartbreaking to see the devastation. We stayed in Chattanooga that night and had some sushi in a hole in the wall little place. It cost an arm and a leg, but it was good for being in the middle of Chattanooga, TN. Georgia - We arrived safe. With two dogs that loved their road trip and slept most of the way. We got our moving truck unloaded with the help of a very nice friend and my car was delivered in one piece! All in all, we could not have asked for a smoother, less eventful move. Our house is wonderful and once I find my camera cable, I'll upload some better pictures! 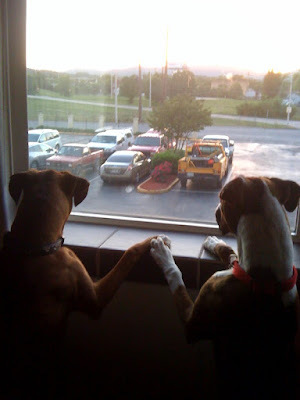 For now, this is Daisy and Sam staring out our hotel window holding hands.